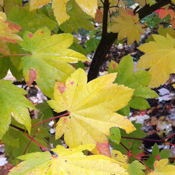 From a small tree to a large shrub, the Vine Maple has elegant form and texture. Airy and delicate, often multi-stemmed, this native is as beautiful as any imported species. The Holly oak is a tough evergreen tree and is as wide as it is tall with a dense canopy. It has a dark green leathery leaf that varies in size and shape. This tree can reach heights of 40-70 with a spread or 30-60 when mature. Fairly fast growing oak that will take many soil types includine clay. The Holly oak is drought tolerant the first few years after planting. Plant in a well drained soil with full sun to part shade. Perfect evergreen shade tree for landscapes, screening or park like settings.